When the CyanogenMod team became Cyanogen Inc, they embarked on a journey to bring the formerly power user-only world of their aftermarket ROM into the hands of standard consumers. Their first move towards this goal was the launch of the Oppo N1 CyanogenMod edition. That N1 CM Edition was significant because it was the first device to come bundled with CyanogenMod, as well as the first time that CyanogenMod has come with bundled Gapps since Google’s famous C&D letter many years ago. Then a month and a half ago, the CyanogenMod team announced that they had a new hardware partner. And given a meeting that was publicized on CM founder Steve Kondik’s Google+ a couple weeks earlier, many believed that this partnership would be a new startup comprised primarily of ex-Oppo employees. Now, some time has passed, and an official announcement has arrived. The new hardware partner is Pete Lau‘s new startup OnePlus, a company aiming to bring devices without compromises, as evidenced by their “#NeverSettle” slogan. The name for this debut phone? OnePlus One. 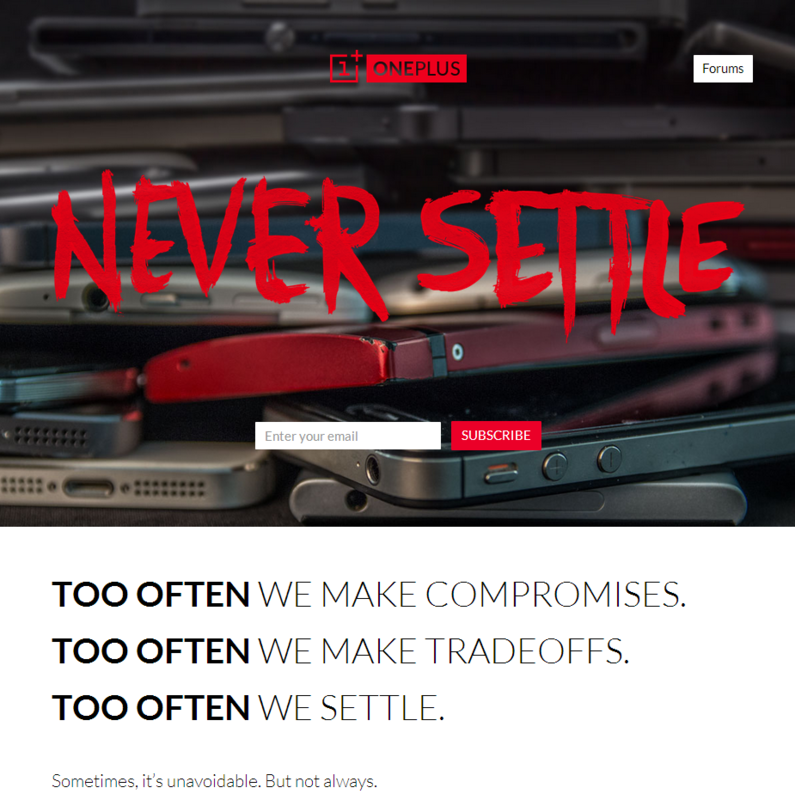 But rather than just building a phone that will run CyanogenMod out the gate, the OnePlus One will run a “specially designed version of CyanogenMod with exciting new elements and features.” There is no word on pricing or specifics on availability other than “first half of 2014,” but we assume that due to their #NeverSettle slogan and stated goals of avoiding compromise, this will be a premium device with a premium price tag. Those interested in reading the official announcement can do so on here. Are you going to be picking up a OnePlus One, or are you dead set on another phone like the crowd favorite Nexus 5? Duke it out in the comments below.